With its prime location just 20 minutes west of Metro Denver and free admission to the public, this premier event draws over 35,000 visitors over 2 days to enjoy art, live entertainment, beer and wine gardens, food vendors, and children’s activities. 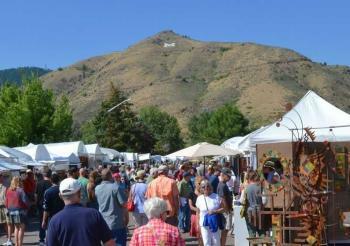 The event, rich in community tradition and a well-established reputation, is limited to 136 artist booth spaces. Produced by the Golden Chamber of Commerce, Golden Fine Arts Festival is a trademark, award-winning annual event with national recognition. Golden’s public art collection is renowned internationally and features some of the best bronze statues in Colorado. The over 30 bronze statues are located throughout the City. Also, keep an eye out for bright and beautiful murals throughout downtown. Golden is home to several art galleries all with a different focus. Wings of Eagles - Native American art, Spirits in the Wind Gallery - Art of the new West, and Foothills Art Center - art exhibitions, public programs, and community partnerships.